(The Root) — In her new book, American Tapestry: The Story of the Black, White, and Multiracial Ancestors of Michelle Obama, Rachel L. Swarns digs up the first lady's family roots. Throughout the meticulously researched tome, Swarns, a New York Times correspondent, uncovers a diverse history that Mrs. Obama hadn't even known herself — including the stories of her great-great-great-grandmother Melvinia Shields, an enslaved girl who, at 8 years of age, was sent from South Carolina to toil in northern-Georgia fields; her biracial great-great-grandfather Dolphus Shields, who was born into slavery and worked as a carpenter after emancipation; and the Jumper family, mixed-race ancestors who lived free in Virginia decades before the Civil War. Swarns spoke with The Root about what struck her most about the project, her extensive research process and what she hopes readers will take away from learning about a family that went from slavery to the White House in five generations. The Root: As you started working on your book, did you approach the first lady and her immediate family about their participation? Rachel L. Swarns: Mrs. Obama has a policy of not doing book interviews, so unfortunately I didn't get a chance to interview her. But I did interview members of her family — an aunt, an uncle, a great-aunt, a great-uncle, first cousins and more distant cousins who were really helpful in illuminating the lives of some of the first lady's ancestors. I briefed her staff during the process, and I sent her and her staff books before publication. I don't know [their reaction], but I hope they find it fascinating. TR: What kinds of research did you do to find these ancestors and their stories? RLS: It was quite an undertaking. [Laughs.] I spent a lot of time in archives around the country, in libraries, and I talked to as many people as I could who knew members of her family and who knew stories about them. The book kind of focuses on her grandparents and as far back as I could take the family. The challenge you have with African Americans is that, during the slavery period, they just didn't appear in the census with names until 1870. So unless they were listed as property in a will or as inventory for an estate, they almost don't exist. White people, though, appeared in the census. With her white ancestors, I can go back a bit into the late 1700s. I also used DNA testing. 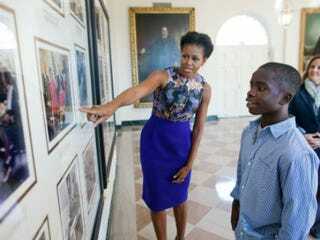 I knew that the first lady's great-great-grandfather was Dolphus Shields, who was Melvinia's son and born into slavery. I suspected that his father, who was a white man, was a member of the family that owned him and his mother, Melvinia. I found as many of Dolphus' descendants as I could, and then as many of the slave owners' descendants as I could. I tested them, and the families were related. TR: What was your most surprising discovery about the first lady's ancestors? RLS: What was most interesting to me was just the range of the American experience that you can see in the first lady's family. You can basically see the sweep of American history through her family. She has ancestors who were Irish Americans who fought for the Confederacy. She has ancestors who were slaves on vast rice plantations. She has ancestors who were mixed-race people who lived free for decades before the Civil War. Her great-grandmother actually lived in [Chicago's] Hyde Park in 1918, just blocks from where the first lady's house is today. She often describes herself as a South Side girl, but her family had no idea that her ancestors had been in Illinois since the 1860s. TR: A lot of the discussion surrounding your book focuses on Michelle Obama's white ancestry, and some readers of The Root felt that her white relatives were perhaps being overemphasized. Do you have any thoughts on that feedback? RLS: I hope that people will read the book. The story of Melvinia and Dolphus and Dolphus' white father is an important part of the story, but the story is such a broad one. It deals with different experiences from different branches of the family, including the Reconstruction period — how opportunities were closed for black people, and the violence that erupted all across the South as white Southerners tried to turn back the clock. It deals with the migration to Chicago, West Virginia, Ohio and Michigan, and what Southerners in her family found when they moved north. Although, I think that story of her white ancestors is reflective of the story of so many African Americans. It's connected to a painful chapter in American history, and there are many, many African Americans who have the very same story in their own families. It's really just an American story; it's part of who we are. TR: What do you hope people will take away from American Tapestry? RLS: I hope that people will look into their own family histories. What's wonderful about Mrs. Obama's ancestors is that they were ordinary people — they were cobblers, sharecroppers, domestics, postal clerks and carpenters. So I hope that people will read this and talk to the older people in their families, and collect records and do this research for themselves. If you're African American and trying to dig back, there's no doubt that it's harder than it is for white families — but it's not impossible. There's so much that you can do with online genealogical resources, DNA testing and records at places like the National Archive and your local courthouses. It's amazing, when you dig back, what you can find.